My quiz is about SpongeBob and how well you know the show if I have to be honest my favourite characters' are Sandy and SpongeBob because they do Karate and SpongeBob is squishy he can turn into all kind of crazy things. 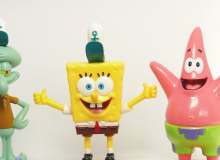 I absolutely love SpongeBob its my favourite show on Nicktoons and I'm thinking they should put it CITV for the children who cant watch things like Disney channel and Nicktoons because the have sky. Who is SpongeBob's teacher at boating school? At work what does SpongeBob flip patties with? In the episode "Trident Trouble" what does SpongeBob's spatula get mixed up with? In the episode "Trident Trouble" what is SpongeBob reading on the way to work?